After Vachiralongkorn Dam (Khao Laem Dam) was built by King Rama IX, the present king, in 9th January 1986, the area behind the dam was requested to be a national park and for celebrating 60 year-old of the king. 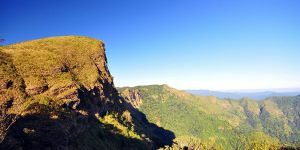 Five years later, 8th November 1991, this area was finally approved to be the 67th national park in Thailand. 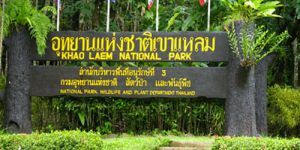 Khao Laem National Park covers an area of about 368,356 acres, completely covering forest surround the Khao Laem dam, Sangklaburi. In the forest there are many varieties of trees and high humidity like tropical rain forest. Some of the area was changed for agriculture purpose. Due to southern and Andaman sea winds, this area can be separated into 3 seasons – summer, rain season, and winter season. However, the winter is not as cold as the winter season in many other countries, especially the western ones. 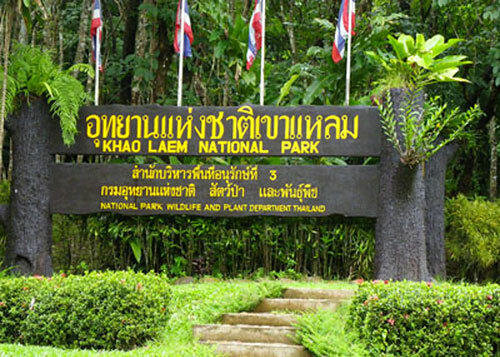 To go to this national park, visitors can take a VIP Bus or mini bus from Kanchanaburi bus terminal in the city. 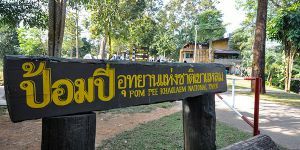 The bus will go to Sungklaburi, but visitors can get off the bus at this national park on the way. Those who come from Bangkok can also take a first class bus (Bangkok – Three Pagodas Pass) from Northern Bus Terminal (Mo Chit), 5 AM or 6 AM.